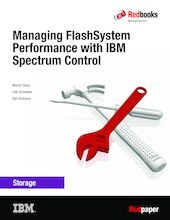 This IBM® Redpaper™ publication discusses on performance monitoring for IBM FlashSystem® storage products. The products reviewed are the IBM FlashSystem FS900, the IBM FlashSystem V9000, and the IBM FlashSystem A9000 and A9000R. For each of the FlashSystem devices, the paper reviews performance monitoring options. The first option is to use features available with the storage management software specific to the respective devices. The other option, which is the focus of this paper, is to use the IBM Spectrum™ Control solution. Using IBM Spectrum Control™ offers the advantage of having a common tool and unique interface to monitor most devices in your storage infrastructure. This paper explains how to take advantage of the many monitoring features and reporting options offered by IBM Spectrum Control. The paper also gives some guidance on how to set appropriate monitoring thresholds and alerts according to your environment.